Ich habe mir ein neues Auto gekauft. Ganz toll. James McAvoy continues his strong showing on my list. "Ganz toll" means well done. Call me insane, but the only film I'd watch again out of this group is Dear Frankie. Okay, I'd watch Almost Famous again, but only for Zooey-related purposes. Thanks. It is a Mazda. 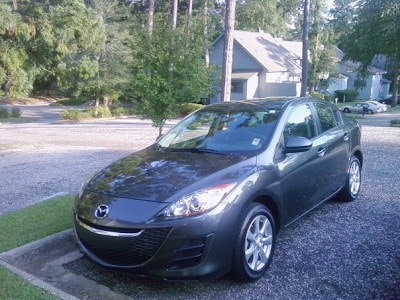 In fact, it's replacing a Mazda, which was my car for the last ten years. D. has a Mazda, too. Brand loyalty! We live in a place with a lot of flora. Fauna, too, including all the geese by the lake. Kate Hudson in Almost Famous? As my wise father once told me, even a blind squirrel can find an acorn sometimes. I watched about a half hour of Infamous. Couldn't watch any more. I have a very soft spot for Dear Frankie, as I appreciate well-done sentimentality. I wish Gerald Butler would go back to movies like this instead of 300. Duel Mazada's? Sweet. I bet Mr. D. drives one of them sporty Miata's. Anyway, I respect brand loyalty. I just asked because I hear there's a small yet vocal group out there who prefer Infamous over Capote. And obviously you're not one of them. It's not exactly smelly. But there is a busted toilet, a ratty looking couch and a television languishing on the curb outside my window.